Shop Farmers Coop for Hi Point Pet Food, by Shawnee Milling Company. 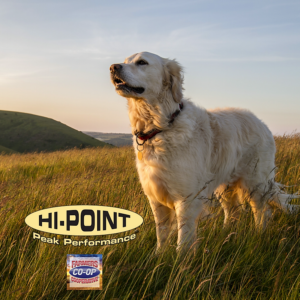 Hi Point provides wholesome nutrition to support a healthy lifestyle for any breed at any stage of life. All ingredients are sourced in the United States and will never be outsourced. At Farmers Coop we stock two lines of Hi Point Feed. The original line and The Country Creations line that contains no corn, wheat or soy and more natural protein. Golden Mini Chunk – Weight management formula for dogs. Low calorie and high fiber. Adult – Maintenance formula for moderately active dogs. Weight management formula. Active – for all breeds from puppy through adult. Highly Active – for all life stages. Highly digestible. Extreme Athlete – Performance, an energy-dense formula for performance dogs. Cat Food – balanced nutrition for kitten and cats. Country Creations Pet Food at Farmers Coop: Corn, Wheat & Soy Free with added natural protein. Hi Point Pet Food verifies all of your ingredients with our on-site lab. Each ingredient is carefully inspected annually to ensure that your products meet the standards that you expect and deserve. This includes a routine third-party food safety inspection. Pick up a bag today at your local Farmers Coop. This entry was posted on Tuesday, August 28th, 2018 at 2:44 pm	and is filed under Cat, Dog, News & Updates. You can follow any responses to this entry through the RSS 2.0 feed. Both comments and pings are currently closed.